2 oz. 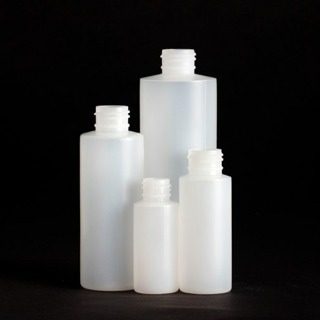 Round Natural HDPE Plastic Cylinder Bottle. Neck Size: 24/410. CAPS ARE NOT INCLUDED. Please purchase your caps, pumps or sprayers, below. 24/410 Black Fine Ribbed Poly Propylene Screw On Cap with F217 Liner. This cap will fit any of our 2 oz. to 16 oz. plastic bottles or any bottle (glass or plastic) with a 24/410 neck. 24/410 Natural Yorker Cap with Red Cap. 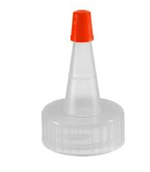 24/410 White Fine Ribbed Poly Propylene Screw On Cap with F217 Liner. This cap will fit any of our 2 oz. to 16 oz. plastic bottles or any bottle (glass or plastic) with a 24/410 neck. Listed here are hard-to-find items not readily available to the general public, but most requested by our customers. All our oils and chemicals are purchased in drums as either/or EP/USP/NSF/KOSHER GRADE, but because they are "repackaged" into smaller containers, we must by law, resell them as "Technical Grade". DISCLAIMER: THESE OILS, LIQUIDS AND CHEMICALS ARE INTENDED SOLELY FOR USE IN BATH AND BODY CARE PRODUCTS, AND NOT FOR ILLEGAL OR ILLICIT USE. LE MELANGE LLC TAKES OR ASSUMES NO RESPONSIBILITY WHATSOEVER IN THIS REGARD FOR THEIR USE OR MISUSE. Le Melange, its owner(s) and employee(s) make no claims whatsoever for the effectiveness - either safe, harmful, or otherwise - of these products. They are here merely due to numerous requests for them and are supplied by us strictly for your convenience. We have not tested any of the formulations listed - that is entirely up to you, as the consumer. This information is provided without warranty of any kind or fitness for a particular use or purpose. You are encouraged to conduct your own tests.